His Majesty King Hamad bin Isa Al Khalifa, the Supreme Commander of Bahrain Defense Force (BDF), paid a visit to BDF General Command where he was welcomed by Defense Minister Lieutenant General Yusef bin Ahmed Al Jalahma, Chief-of-Staff Lieutenant General Dhiab bin Saqr Al Nuaimi and Senior Officers. The King was accompanied by Royal Guard Commander Brigadier Sheikh Nasser bin Hamad Al Khalifa and Royal Guard Special Force Commander Major Sheikh Khalid bin Hamad Al Khalifa, according to Bahrain News Agency (BNA). 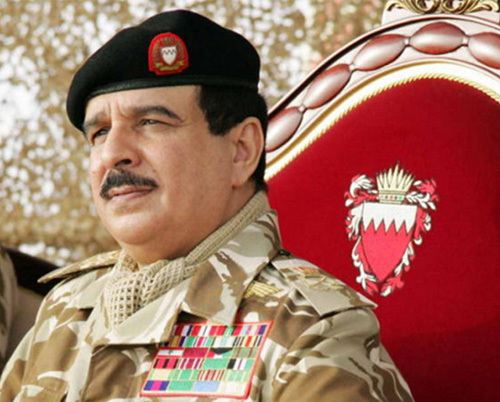 King Hamad followed up on BDF’s continuous participation in the Operation Restoring Hope as part of the Saudi-led Arab coalition. He lauded the noble humanitarian efforts of the Kingdom of Saudi Arabia spearheaded by Custodian of the Two Holy Mosques King Salman bin Abdulaziz Al Saud to provide assistance for the Yemeni people and serve Arab and Islamic issues. The King praised courage of the Saudi Armed Forces in deterring the terrorist attacks, commending contribution of the brave BDF personnel in standing united with their brethren from the Saudi and UAE Armed Forces to defend the southern border of Saudi Arabia. He wished the BDF personnel every success. Meanwhile, Bahrain’s Defense Affairs Minister Lt-General Yousef bin Ahmed Al Jalahma received the Commander of Australian Combined Operations Forces Air Marshal Mell Hupfeld accompanied with Vice Admiral Jimmy Hatcher, Commander of the Combined Task Force (CTF633). The two sides discussed topics pertaining to boosting the current cooperation ties. Senior BDF officers were present as well as the Riyadh-based Australian Military Attaché accredited to Bahrain, Col. Bradley Scott.